The Virginia Cavaliers men's basketball program represents the University of Virginia in the Atlantic Coast Conference in Division I of the NCAA. The team is coached by Tony Bennett. Since 2006 the team has played at John Paul Jones Arena, an on-campus arena on the North Grounds of the university, in front of 14,593. A consistent winner in the early years of college basketball under the tutelage of Pop Lannigan (254–95 from 1905 to 1929), the Cavalier program lay mostly dormant between 1930 and 1975 before Terry Holland arrived to win their first ACC Championship and earn their first NCAA Tournament appearance in his second year. UVA has since finished first in the ACC basketball standings nine times, third best all-time. They have won the ACC Tournament three times. Virginia won the 2019 NCAA Tournament Championship, has been to the Final Four of the NCAA Tournament three times, and won the last third-place game ever played at the event. The Cavaliers have been in the Top 5 of the AP Poll a total of 96 weeks in the past four decades, ranking the program 9th since 1980. Never making the Top 5 from the first poll in 1949 until 1981, the program still ranks 16th all-time by this measure. The Wahoos, as they are unofficially known, began their history under the tutelage of a Welshman and American immigrant known best as "Pop", Henry Lannigan. Lannigan began the program in 1905 after training Olympic Games hopefuls in track and field and quickly brought the basketball program into near-dominant form. He led the Cavaliers to a perfect record of 17–0 in 1914-15 and a Southern Conference title in its inaugeral season of 1921-22. After reaching prominence the team was invited to help the nationally known Kentucky Wildcats showcase their new Alumni Gymnasium. Virginia dominated Kentucky, 29–16. Inviting Kentucky back to Memorial Gymnasium in 1928, Virginia again won, 31–28. Lannigan's record of 254–95 (.728) held the Virginia record for best career winning percentage by a head coach until finally surpassed by a man who was hired 104 years after he started the program. After Lannigan's sudden death in 1930 and with limited administration interest at the onset of the Great Depression, Virginia basketball did not maintain its momentum into the next several decades. Buzzy Wilkinson scored 32.1 points per game in 1954-55 and is still the all-time ACC leader in scoring per game for both the single-season and career (28.1) categories. He was selected by the Boston Celtics in the 1955 NBA Draft. Unfortunately, Virginia teams of the era were not as great at defense and high scoring did not lead to many wins. Likewise, Barry Parkhill was named ACC Men's Basketball Player of the Year in 1971–72 and was drafted in the first round by the Portland Trail Blazers but the program had not regained its early standing. Terry Holland was hired from Davidson in 1975, and with star Wally Walker surprised the ACC in just his second year as head coach when his sixth-seeded Virginia defeated AP No. 17 NC State, No. 9 Maryland and No. 4 North Carolina en route to winning the school's first ACC Championship. Played in Landover, Maryland, it was also and fittingly the first ACC Tournament held outside of North Carolina. 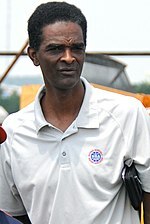 Athletic, quick, and seven-foot-four, Ralph Sampson was perhaps the most desired high school recruit in college basketball history when he chose to play with Jeff Lamp at Virginia over Kentucky in 1979. He lived up to that hype would become one of the most dominant college players the game has ever known, winning three consecutive Naismith College Player of the Year awards to tie him with Bill Walton as the most awarded individual player in NCAA history. Virginia would attain its first AP Top 5 rankings and go to its first Final Four in Sampson's era, but would be stonewalled by Dean Smith and North Carolina both in that Final Four and in ACC Tournaments. Carolina notoriously held the ball in a four corners offense for most of the last seven minutes of the game, despite having UNC’s most celebrated NBA superstars Michael Jordan and James Worthy on the floor, to defeat Virginia in the 1982 ACC Tournament 47–45. Both the shot clock and three-point line were implemented into college basketball during the same decade in part to combat such shenanigans. In 1984, after Sampson was drafted first in the 1983 NBA Draft, Virginia made a Cinderella run back to the Final Four. There they lost 49–47, in overtime[a], to a Houston team led by the first pick of the 1984 NBA Draft, Hakeem Olajuwon, who then joined Sampson to form the original Twin Towers of the NBA on the Houston Rockets. John Crotty and Bryant Stith took the darkhorse 1988–89 team to the Elite Eight after defeating a No. 1 seed Oklahoma team which returned most of its lineup (including Mookie Blaylock and Stacey King) from the team that reached the 1988 NCAA Tournament Championship Game. After Holland retired, the Cavaliers were coached by Jeff Jones, Pete Gillen, and Dave Leitao. Highlights of those teams include a Jones team headlined by Cory Alexander and Junior Burrough that also reached the Elite Eight after a first-place finish in the ACC standings of 1995. There were no championship teams under Gillen, but his recruits Sean Singletary and J. R. Reynolds led the 2007 team to Virginia's next conference-topping finish in Leitao's second season. While there were flashes of brilliance under each of the three coaches, the program regained and expanded its national prominence under the one who followed them. Tony Bennett arrived in March 2009 and got to work in building ”a program that lasts." His 2013–14 team led by Joe Harris and Malcolm Brogdon brought Virginia its first ACC Tournament Championship in 38 years and its first Sweet Sixteen appearance in 19 years. The 2014–15 squad, led by Justin Anderson and Brogdon, started 19–0 and was even more dominant throughout the season as this team more than doubled up the scores of Georgia Tech and Wake Forest, only the second and third times in history that one ACC team scored twice as many points as another ACC team in official competition. However, Anderson broke his finger against Louisville and did not return until the NCAA Tournament where he was much diminished and the team bowed out to Michigan State in the second round. Brogdon led the 2015–16 team to the Elite Eight, but they fell just short of the elusive Final Four after a late rally by Syracuse. Shocking the basketball world twice in two years, Virginia lost to 16-seed UMBC in the first round of the 2018 NCAA Tournament only to come back and win the 2019 NCAA Tournament Championship the very next year. ESPN called Virginia's 2018–19 campaign "the most redemptive season in the history of college basketball." CBS This Morning called it "basketball's ultimate redemption story" the morning after the national championship match. As of 2019, Bennett has led Virginia to the program's first NCAA Championship, third Final Four, second and third ACC Championships, and four of nine seasons Virginia has finished first in the ACC season standings. He holds the single-season wins record of 35 from the 2018–19 season, breaking his own previous record of 31. Virginia is 3–2 at Final Four events and won the 2019 NCAA Tournament Championship. Also see 2018–19: National Championship section of Tony Bennett. This Virginia team featured a vaunted Bennett defense along with the three-pronged offensive attack of De'Andre Hunter, Kyle Guy, and Ty Jerome. The Cavaliers began and ended the season ranked in the AP Top 5 with a 28–2 regular season. One noteworthy event along the way was when No. 4 Virginia soundly defeated No. 9 Virginia Tech 81–59 after Buzz Williams had turned that squad into the first AP Top Ten Hokie team Virginia had ever faced in history. In the ACC Tournament, Virginia defeated bubble team NC State 76–56 before being physically overpowered by a very tall Florida State team, 69–59. This was only the third loss of the year after two defeats to Zion Williamson and his Duke squad featuring several one-and-done rule NBA lottery picks. The two UVA–Duke matchups were the most watched nationwide college basketball games of the regular season with 3.8 million and 3.3 million viewers for their games in Durham and Charlottesville respectively. Entering the NCAA Tournament, Duke was then the number one overall seed and placed in the East regional while ACC teams Virginia and North Carolina also received No. 1 seeds in their respective South and Midwest regions. The only No. 1 seed from outside the ACC was Gonzaga in the West, later to be defeated by Texas Tech in the Elite Eight. Virginia in fact became the only No. 1 seed of the tournament to advance to the Final Four and did so in electrifying fashion over Purdue. After first defeating Gardner-Webb, Oklahoma, and Oregon, they met the red-hot Boilermakers who had taken out defending champion Villanova and No. 2 seed Tennessee. Virginia would get out to a ten-point lead before Carsen Edwards started making one 27-foot to 28-foot three-pointer after another, and there was no answer Virginia could come up with to stop him. He scored 42 points (after also scoring 42 against Villanova), by far a record against a Bennett-coached team. Down by three points with 5.9 seconds to play, Ty Jerome stepped to the line for two free throws. He made the first but missed the second, yet Mamadi Diakite backtapped the ball into the backcourt where Kihei Clark recovered and sent a bullet pass back to Diakite with only one second remaining in the game. Diakite immediately shot, the ball went through, and the game went into an improbable overtime. Virginia then outscored Purdue 10–5 in the extra period to advance. Jerome, Diakite, and Kyle Guy each made the South Regional All-Tournament team. In the Final Four, Virginia met the Auburn Tigers who had already dispatched of Kansas, North Carolina, and Kentucky to get there. This game was a back-and-forth battle as Virginia trailed the Tigers at halftime, 31–28. Virginia made a convincing comeback in the second half and led 57–47 before Auburn made their own as Bryce Brown and Jared Harper nailed three-point shots and the Tigers went on a 14-point run. Down 61–57 with 7.7 seconds remaining, Guy nailed a three-point shot from the right corner. Harper then converted one of two free throws to lead 62–60. The referees appeared to miss a foul on Auburn which caused a double dribble from Jerome, which wasn't called either, before Auburn was finally called for a foul with 1.5 seconds remaining. On the in-bounds play Jerome found Guy, again for the corner three, but Guy missed as an Auburn player fouled him by undercutting his lower body. Videos of Auburn fans who pre-maturely celebrated without realizing a foul had been committed were widely circulated and became part of Jimmy Kimmel Live! the following night. Guy drained all three free throws to put Virginia into the 2019 NCAA Tournament Championship Game. The National Championship match was headlined by two of the top defenses in college basketball, Virginia and the Texas Tech Red Raiders. Virginia didn't allow Texas Tech to score a field goal until 7½ minutes into the first half, but a barrage of three-point field goals by the Red Raiders allowed them to catch up and even lead the 'Hoos 25–22. Virginia then tightened up and scored some of their own to lead at halftime, 32–29. Potential future NBA first-rounders De'Andre Hunter and Jarrett Culver shot 1-for-8 and 0-for-6 from the field in the first half respectively, but Hunter came roaring out for the second half and shot 7-for-8 to end with a career-high 27 points while the NABC Defensive Player of the Year sophomore limited Culver to 5-for-22 shooting and a 15 point total. Texas Tech again rallied from a deficit to take a lead, and Virginia again matched them as the game went into overtime. Virginia was too much for the Red Raiders in the overtime period, outscoring them 17–9 to win their first national title 85–77. Virginia ended the season with a 35–3 record, shattering the previous record for single-season wins at Virginia. The team was 29–0 after leading at halftime. The Cavaliers were the first first-time champions of the NCAA Tournament since the University of Florida thirteen years earlier. Virginia has won the ACC Tournament three times, defeating Duke or North Carolina in each title game. The Cavaliers have appeared in the NCAA Tournament twenty-three times. Their combined record is 35–22. They were national champions in 2019. The Cavaliers have appeared in the National Invitation Tournament (NIT) 13 times. Their combined record is 17–11. They were NIT champions in 1980 and 1992. The Cavaliers have appeared in the College Basketball Invitational (CBI) once, in 2008. Their record is 2–1. Following conference realignment, the Cardinals moved from the Big East to the ACC and were designated UVA's home-and-away rivals. The two teams had previously met for four straight years outside of their conferences in the 1980s during an era both programs were highly ranked. The Cavaliers won each of those games in 1982, 1983, 1984, and 1985. In the ACC, the two teams have acted as spoilers to the other with a Cardinal win in 2015 and a 2017 Cavalier win delaying or preventing an ACC regular season title, while an injury to star player Justin Anderson during the 2015 matchup derailed UVA's national championship aspirations. The March 2018 matchup between the two teams ended with Virginia scoring five points in the final 0.9 seconds and dealing what proved to be a mortal blow to Louisville's NCAA tournament hopes. Both teams won NCAA Championships in the 2010s — Louisville in 2013 (later vacated) and Virginia in 2019. UVA leads the all-time series 15–4. As the two Power Conference teams in the Commonwealth, the Cavaliers and Hokies have a long-standing rivalry. While the intensity has picked up since Virginia Tech joined the ACC in 2004, the all-time series record is well in favor of UVA, with the Cavaliers leading the series 96–56. Buzz Williams was only 3–7 against Virginia before departing from Tech, but did lead the Hokies to hand UVA the only blemish of the Wahoos' 17–1 ACC season in 2018. As two of the ACC's oldest members, the UVA–UNC rivalry spans many sports and has persisted to varying degrees since the late 1800s. The early 1980s were a particular highlight for the basketball series as all-time greats Ralph Sampson and Michael Jordan led two Top 5 programs of the era. The Tar Heels have dominated much of the all-time series and lead 131–57, but Virginia is 8–4 against the Heels since the Cavaliers began their rise back to national prominence under Tony Bennett in the 2012–13 season. The two teams defeated each other for ACC Tournament Championships in 2016 and 2018, and the winner of those conference title matches went on to win NCAA Championships the following year (UNC in 2017 and UVA in 2019). Thanks to the proximity of these two long-time ACC members, and their status as Tobacco Road outsiders, Maryland and Virginia have a long-standing rivalry that spans many decades. Traditionally, these two schools would meet in the last game of the season, and acted as spoilers to each other as they sought ACC season championships and NCAA Tournament appearances. This rivalry has been diminished in recent years, thanks to Maryland's move to the Big Ten Conference. They did match up in the 2014 and 2018 ACC-Big Ten Challenges, ending in 76–65 and 76–71 Cavalier victories which were both won on the road in College Park. Malcolm Brogdon, the most recent Cavalier to have his number retired, went on to win the 2017 NBA Rookie of the Year Award. The University of Virginia's athletic department has issued the following statement distinguishing "retired jerseys" from "retired numbers": "Jersey retirement honors Virginia players who have significantly impacted the program. Individuals recognized in this way will have their jerseys retired, but their number will remain active." ^ This is the only NCAA Tournament game that Virginia has lost in overtime. UVA's record in NCAA Tournament overtime periods is 4–1 as of 2019. ^ University of Virginia Athletics Current Logo Sheet (PDF). July 10, 2017. Retrieved April 1, 2019. ^ a b c The News Leader, Henry Lannigan obituary, Staunton, Virginia. Published December 26, 1930. ^ 2013-14 Atlantic Coast Conference Men's Basketball Media Guide, p.145-156. ^ "Most ever against a Bennett-coached team" mentioned during the live radio broadcast of this game by WWWV. ^ a b National championship predictions: Will UVa or Texas Tech win first title?, accessed April 13, 2019. Quote from Jeff Borzello of ESPN Insider: "As for Saturday night, it was a clear foul by Samir Doughty on Kyle Guy. End of discussion. Fouled him on the way up, and didn't let him land. The missed-double-dribble debate is a different story, but then we have to get into a debate about the missed foul when Bryce Brown grabbed Ty Jerome a split second before the double dribble. Missed calls happen. It is what it is." ^ "All-Time Results". VirginiaSports.com. Retrieved 1 January 2015. ^ a b c d "2014–15 Virginia Men's Basketball Factbook" (PDF). VIRGINIASPORTS.COM – The University of Virginia Official Athletic Site. pp. 52–53. Retrieved 1 January 2015. ^ "Malcolm Brogdon's Number To Be Retired" (Press release). Virginia Cavaliers. December 15, 2016. Retrieved December 15, 2016. ^ 2008 Virginia Football Media Guide, page 175. The University of Virginia has not released a similar policy statement regarding basketball jerseys, but the same "retired jerseys" terminology is being used as to both the football and basketball programs. This page was last edited on 23 April 2019, at 11:16 (UTC).